Looking Back At GODZILLA: KING OF THE MONSTERS! | Warped Factor - Words in the Key of Geek. Looking Back At GODZILLA: KING OF THE MONSTERS! 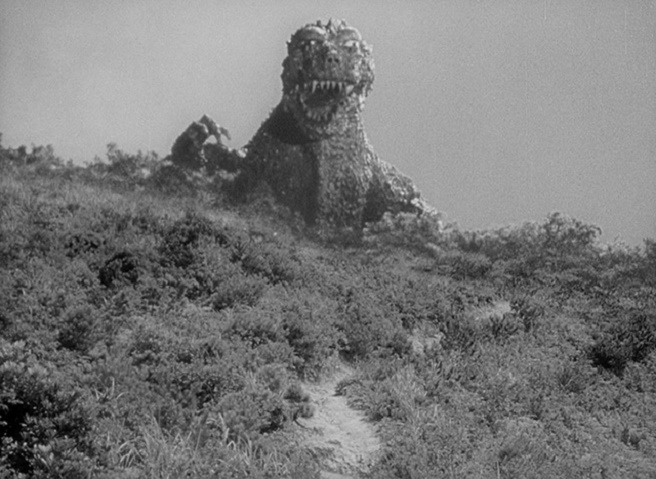 Matthew Kresal looks back at the first American version of Godzilla. 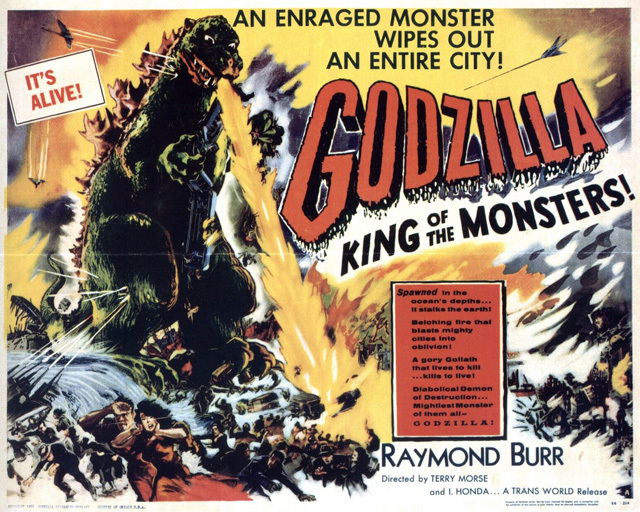 This year marks the sixtieth anniversary since American audiences first met the towering monster known as Godzilla. But how they met him wasn't quite how Japanese audiences first discovered him two years earlier. Godzilla: King Of The Monsters! as the American version of the film came to be known is a mixture of the original 1954 film with newly filmed material to create an interesting hybrid and, thanks to a fairly recent Criterion Collection release, it's possible to watch and judge both films separately and together. The way that this hybrid version works is rather neat. Instead of releasing a subtitled version of the original Japanese film or dubbing it into English in its entirety, the original is reimagined and reedited to an extent. 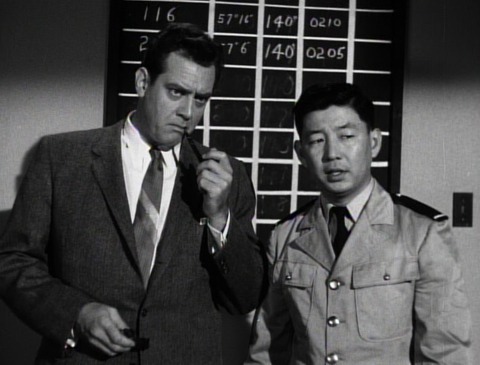 The focus is on a Western journalist named Steve Martin (played by Raymond Burr, who is perhaps best known for his role as attorney Perry Mason) who ends up in Japan during a flight and stays to cover the unfolding events. Along the way he finds himself present in many of the original film's sequences and interacts with its lead characters. It's an interesting way to do things to be sure. To accomplish this, the original film is restructured. It ends up largely being told in flashback, opening with Tokyo in ruins with Burr's Martin among the rubble. Taken to hospital, Martin takes the viewer back through the events of the previous few days. King Of Monsters takes a conventional linear narrative and does something rather more interesting with it by reworking how it unfolds. Seeing the film for the first time right around a decade ago, it's a move that built tension into the plot by leaving the viewer wondering what had happened. Seeing this version now and practically back to back with the original, I still find it an admirable idea and quite a successful one. There's also the business of putting a character into scenes he was never in to begin with. For the most part that's done successfully by having Martin off on the sidelines where he can see events but only rarely interact with them. It's easy to watch and see where it would have been possible for Martin to have featured in the film quite plausibly. (Indeed there are times when it feels a bit like Trials and Tribble-ations, the 1997 Star Trek: Deep Space Nine episode which had characters from that series interacting with the Original Series Enterprise crew on the sidelines of one of its episodes.) Burr himself does a good job in terms of his performance to make everything work, and he's got some effective moments such as his reporting of the rampage of Godzilla through Tokyo. On the whole, the filmmakers efforts are largely successful. Largely, but not completely. Despite laudable efforts to get cinematography and other elements to match, they never quite do. There's an obvious difference in the old footage and the new footage just in the way it looks, which I suspect is probably down to film stock. Also the decision to dub some of the Japanese dialogue but not other moments comes across feeling very weird. There are times when characters swap back and forth between Japanese and English without any good reason to (except for audience understanding when Martin isn't around). Plus, as good as the efforts are to insert Burr into the film, there are times when it becomes blatantly obvious that he wasn't there and he's talking to doubles in an effort to advance his involvement with the plot. The prime examples of this being his conversation with Dr. Yamane to join the group heading to Oko Island and talking with Emiko and Ogata in the hospital. Something else gets lost in the process as well. There's a thoughtful edge to the original Japanese version which helps to raise above many other monster features. By restructuring the film, reediting parts of it, and cutting a sizable chunk out of it it loses some of that thoughtful edge. A lot of talk about nuclear weapons and how they've had an effect on Godzilla gets lost and the dilemma faced by Dr. Serizawa loses a significant amount of its impact by being effectively reduced to melodrama. That thoughtfulness is still there in bits and pieces but it's full impact isn't present, and it ends up being lost almost entirely in places. In turning Godzilla into Godzilla: King Of The Monsters!, perhaps more is lost than is gained. It loses some of its thoughtful edge while the quality of the overall product is hampered somewhat by moments of poor dubbing and efforts to shoehorn a Western character into a Japanese film. Yet the attempts to fit that character in work more often than not, with Burr making an admirable effort in his new main role. Is it better than the original film? No it isn't. Is it worth seeing, either on its own or as a curiosity? Most definitely. If nothing else, it stands as one of the great examples of how to take one film and make it into something a bit different through the magic of filmmaking.